Football Picks Up First Win of the Season | The Gettysburgian. Gettysburg beat Juniata 33-17 for their first win of the season. Not only was this the team’s first win, but it was also head coach Kevin Burke’s first win as Gettysburg’s head coach. “I’m just happy for our kids. They did a great job and deserve it,” said Coach Burke. The offense racked up 370 total yards in an impressive showing in sophomore quarterback Mike Welsh’s first game back. Welsh went 11-for-17 and connected with 9 different receivers for 129 yards and a touchdown. He also added 66 on his feet. On the ground, the Bullets had another great performance, posting 241 yards. Senior Nick Rella had his best game of the season thus far, rushing for 91 yards on 23 carries. Andrew Howard also added 79 yards. “Between the offensive line and the running back, it takes a lot of practice and a lot of time to get everything synchronized and we’re starting to be more on the same page,” said Coach Burke. On defense, the Bullets stymied Juniata for most of the game. The defense held Juniata to under 200 yards and just 30 rushing yards. The unit was especially stout on third down, only allowing 2 conversions on 17 chances. Senior Jake Skinner led the team in tackles with 9 and junior Jordan Mason added 6 tackles, 2 sacks, and 3 pass breakups. Senior Logan Aikey also finished with 3 tackles, 1.5 sacks, and 1 pass break up. Sophomore Thomeir Richardson had 3 tackles and added another interception, giving him 4 on the season. Senior safety Mike McKnight ended with 3 tackles and an interception as well. On Gettysburg’s first drive, the offense set the tone by running the football. Senior running back Nick Rella ran it 9 times and capped off the drive with a touchdown. Later in the quarter junior Justin Geisel booted a 31-yard field goal to put the Bullets up 10-0. “He’s absolutely huge because you know as a play caller you got 3 and you got to protect it. He’s an unbelievable asset,” Coach Burke said of Geisel. The defense forced another 3-and-out on the next drive. Stricken by penalties, the offense found themselves in a 3rd-and-18 and could not get out of it. 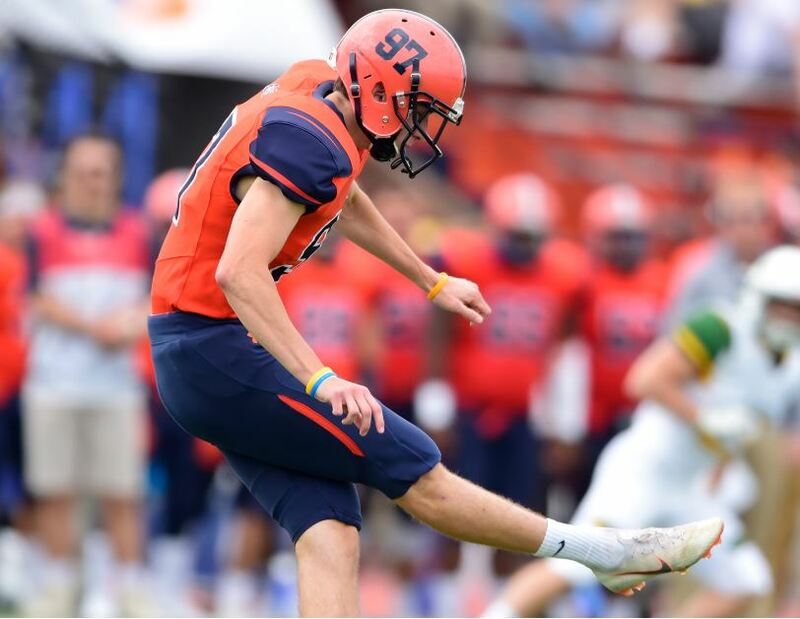 Geisel knocked down his second field goal of the day from 38 yards to make the score 13-0 Gettysburg. After another strong defensive stand, the Gettysburg offense put together an 8-play, 88-yard drive to start off the second quarter. Sophomore quarterback Mike Welsh carried the drive and finished it with a 17-yard pass to sophomore wide-out Kevin O’Hanlon. With about 5 minutes left in the half, Juniata’s Adam Kipp sacked Mike Welsh and forced a fumble, which was recovered by Dan Drop Jr. Juniata got the ball with just 10 yards to go and running back Ian Border ran it in to get Juniata on the board, 20-7. Gettysburg’s offense struggled on the next drive and punted the ball down to Juniata’s 5-yard line. Quarterback Jason Jones dotted his way down the field to the Gettysburg 22 where Gettysburg defense made a strong stop. Sam Craig nailed the 39-yard field goal to make the score 20-10 to end the half. Juniata opened the second half with a strong 8-play, 62-yard drive, finished off with a touchdown pass to Alex Stoner to push Juniata closer 20-17. Gettysburg responded on the next drive to score with a 6-yard touchdown run from junior Andrew Howard. At the start of the 4th quarter, Gettysburg had a solid drive ending in a 24 yard field goal putting Gettysburg up 30-17. With about 2 minutes left, Mike McKnight picked off Jason Jones to take back possession. Moments later, Justin Geisel drilled his 4th field goal of the day from 41 yards out, adding another 3 on the scoreboard to make it 33-17. Thomeir Richardson closed out the game with an interception of his own. Gettysburg Football hopes to add to their winning streak at home this week against Johns Hopkins on Saturday, October 20th, at 1 pm.